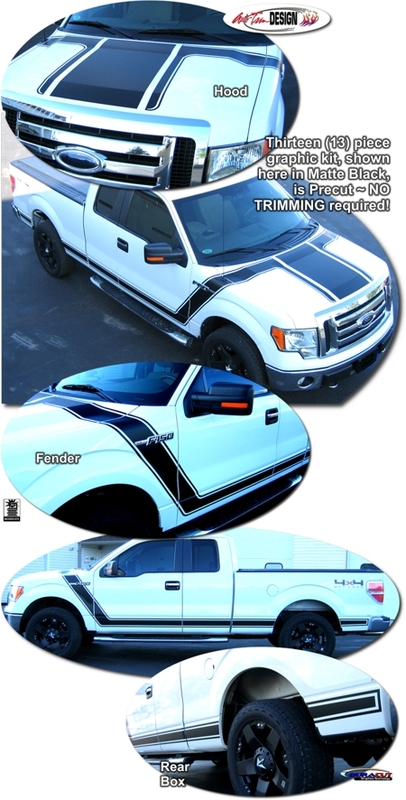 Make your '09-'14 Ford F-150 stand out from the rest with this great-looking BOSS inspired Graphic kit. Kit is PRECUT and ready to install in a wide variety of colors. Slight trimming required at Rear Door jambs as well as Cab/Box connection. As you can see, graphic package is not just a generic set of stripes. Kit is specifically made for the '09-'14 Ford F-150 and will not fit any other vehicle. Graphic kit has been configured to fit SuperCab, SuperCrew as well as Long Box model combinations with slight trimming required at Rear Door jambs as well as Cab/Box connection.